RyanAir, how do you confound us? Let us count the ways. Actually, I wrote a diatribe over at the Lighten Up! blog, so you can read that if you like. Otherwise, just know that packing our stuff into a RyanAir-acceptable condition was like stuffing the proverbial elephant into a Volkswagen. Monday was spent getting ready to go. 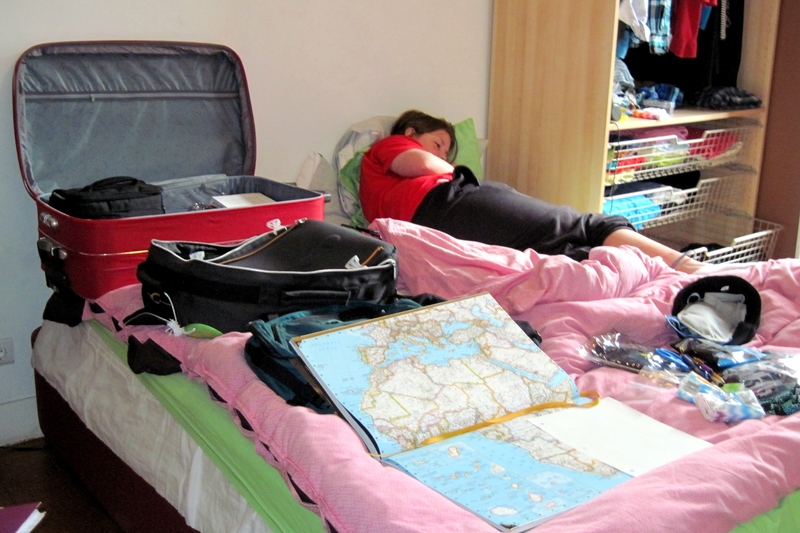 We literally spread out every single thing we’d packed, and analyzed (and re-analyzed) its chances of getting to continue on the trip with us. We sorted; we debated; we purged; we packed; we weighed. Over and over and over. We also did regular-person things: laundry, cleaning up the apartment, trying to eat all the perishable food from the refrigerator, sorting through our receipts to see how much money we’d spent in Lisbon and entering it onto a spreadsheet. Q did homework (“Here, honey! If you finish this, we can throw the book away!”) and tried to keep out of our way. To cap off this stressful day, we decided that we simply had to treat ourselves to dinner at a place that had been recommended to us repeatedly: Pizzeria Casanova, which was reputed to have the best pizza ever and was conveniently located just the other side of Santa Apolónia station. Depending on who you ask, it was either the best meal ever (Quinland) or a complete waste of way too much money (David). Either way, no one can argue that we ate on a lovely terrace right beside the Rio Tejo and that we had a very nice evening. There was even a record store right next door, so we squeezed in a little record-shopping as well. After a quick stop at Pingo Doce to get bread for sandwiches, David headed to Game Night at Al Café, while Q and I went home. I had a Skype date with the lovely Patti to go over how to do year-end journal entries (exciting!). It was a fabulous call – it was great to see everyone at work and to take Patti on a virtual tour of Lisboa Pátria . Quinland thought I was ridiculous carrying the laptop around and pointing it at various things in the house, but it was fun. At least on my side. On Patti’s side, it may not have made the slightest bit of sense. Expenditures: Very expensive dinner at Pizzeria Casanova, sandwich bread at Pingo Doce. Experiences: Our first time on the river side of the station. Got a close-up look at Lux nightclub, a peek into a Portuguese indie record store, and a great view from the river up to our neighborhood.